Most of the people at JibJab have fun little toys on our desks. Some display ridiculous props from our videos, while others feature favorite cartoon characters and action figures. But nobody’s collection comes even close to Dave on our design team, whose love for all things anime and geek have resulted in a collection that would make ToyFare jealous. 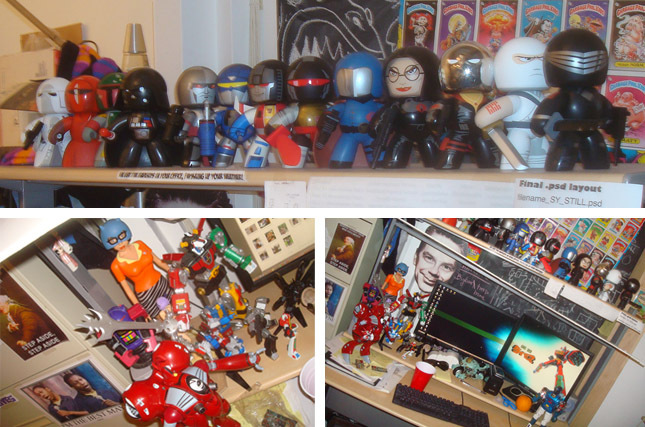 Behold the fabled Mighty Mugs, Transformers, Macross and Voltron robots of Dave’s desk! Dave’s love for all things mech-warrior has shown on art he has created for the site. Here’s something you may have missed, check out the tip of the Capitol Building at the end of last year’s Leprechaun Bailout card. Look familiar? This entry was written by paulhanges and posted on February 19, 2010 at 6:11 pm and filed under Inside JibJab. Bookmark the permalink. Follow any comments here with the RSS feed for this post. Trackbacks are closed, but you can post a comment. I didn’t know there was a Tim Robbins transformer! I want one!